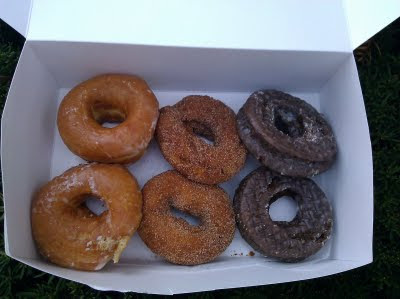 Booty from a quick stop at Donut Dip in West Springfield, Massachusetts: honey glazed, apple cider and chocolate glazed donuts. I had to choose from 49 varieties and had only three donut-loving children to feed, so I restrained myself and only bought a half-dozen. Donut Dip sits conveniently near the intersection of I-91 and I-90 in western Massachusetts. It's a two-minute detour if you're on either route. I highly recommend paying them a visit. These were fantastic donuts. P.S. Three children think I am the greatest mother/aunt in the world. Donuts rule. What I love about the Donut Dip (besides the donuts) is the 1950s signage, inside and out. And all the old local guys in there buying coffee and chatting.